Count Jan Potocki (Polish pronunciation: [ˈjan pɔˈtɔt͡skʲi]; 8 March 1761 – 23 December 1815) was a Polish nobleman, Polish Army Captain of Engineers, ethnologist, Egyptologist, linguist, traveler, adventurer and popular author of the Enlightenment period, whose life and exploits made him a legendary figure in his homeland. Outside Poland he is known chiefly for his novel, The Manuscript Found in Saragossa. Potocki's most famous work, originally written in French, is The Manuscript Found in Saragossa (Manuscrit trouvé à Saragosse). It is a frame tale. On account of its rich, interlocking structure, and telescoping story sequences, the novel has drawn comparisons to such celebrated works as the Decameron and the Arabian Nights. 1 2 3 4 The Mystical Count Potocki. Fortean Times. at the Wayback Machine (archived August 11, 2002) Retrieved September 22, 2011. 1 2 Count Jan Potocki: The Saragossa Manuscript. Book review by Anthony Campbell (2001). Retrieved September 22, 2011. 1 2 3 Krzysztof Bauer (1991). Uchwalenie i obrona Konstytucji 3 Maja. Wydawnictwa Szkolne i Pedagogiczne. p. 38. ISBN 978-83-02-04615-5. Retrieved 2 January 2012. ↑ However, Justin (March 10, 2009). "Jan Potocki and the Manuscript Found in Saragossa". Tor.com. 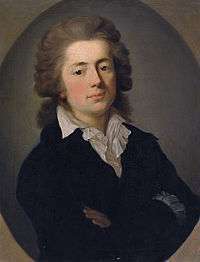 Wikimedia Commons has media related to Jan Potocki.